The Minute Clinic inside CVS in Cleveland, Tennessee won't see me return. Medical care here is like going to the DMV with less people. My visit two days ago combined the first visit with the last. My doctor was on vacation when my asthma kicked into gear with a humdinger case of bronchitis. Going to the Minute Clinic inside CVS seemed like a good idea. Insurance companies often encourage use of places like this instead of an ER or urgent care facility. Ultimately, I ended up at the ER anyway and wasted time and money getting healthcare at the Minute Clinic. You can bet that I won't do that again. The experience left me hoping that this isn't the wave of the future. Can you imagine a medical clinic where a doctor is only available remotely? That's how it is in the Minute Clinic in Cleveland. The sign on the wall saying that did give me pause. It also seemed odd that only a couple chairs outside of the registration kiosk. That should have been another clue. The only friendly face that takes your information is your reflection staring back at you through the computer screen. The computer prompts you on what details to enter and gives you an appointment time when you finish entering the data. Typing this in is a challenge when you're coughing a lot. Fortunately, it only took a few minutes (and Hubby was there to help). The computer said that my appointment was in 18 minutes. It was actually less than five before one of two large wooden doors swung open and a friendly faced young woman directed me inside. The nurse practitioner showed me where to sit. The space was a combination exam room, and insurance and information verification. The nurse practitioner was secretary, assistant, healthcare provider and cashier. This Minute Clinic is as bare bones as you get. The office fee starts at $99. There are other charges for strep tests, labs and other services. Of course, I didn't see any other services being done so I can only assume they are offered. The nurse practitioner seemed knowledgeable and was professional. She also has a set Standard of Care protocol to follow. This meant that she gave me cups of water instead of a breathing treatment when I was trying to hack a lung up. 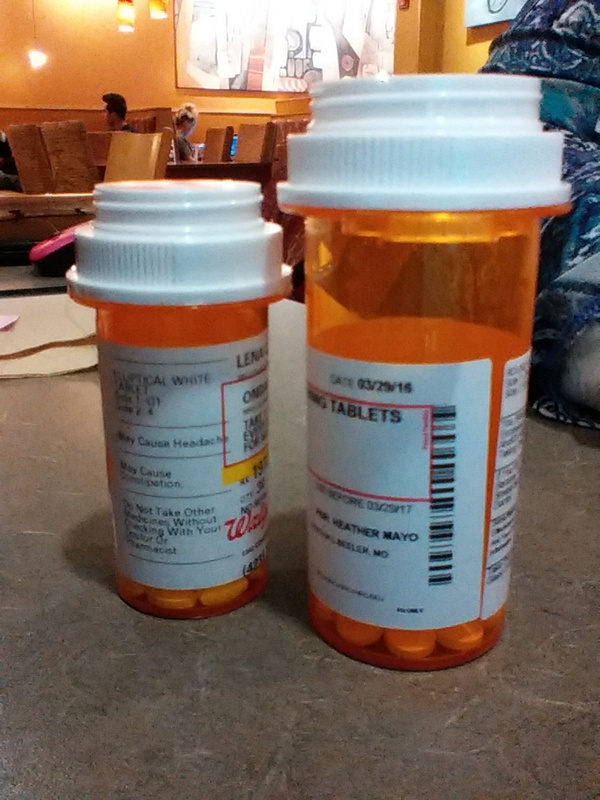 Citing the Minute Clinic standard of care, she could only prescribe the same inhaler that I was already using, give me an antibiotic and cough medicine. I was already doing two of the three and told her that my confidence level was low that they would keep my symptoms for worsening. She added a second cough medicine, asked for payment and said my prescriptions had been transmitted to my regular pharmacy. My lungs went south a few hours later. I could have won an Old Geezers wheezing competition by the time we arrived at the ER that evening. The musical sounds were loud enough that the ER doc ordered a breathing treatment and x-ray before touching me with a stethoscope. My music major daughter could probably have worked the sounds into a musical score if she had felt so inclined. Fortunately, she didn't. A few hours later (and most likely several hundred dollars poorer) I felt better enough to go home. That was two days ago. As of this typing I'm still using the breathing treatments, taking the other medicines and wondering about the ER bill. Most of all, I'm wondering why on earth anyone would go to the Minute Clinic in Cleveland for healthcare a second time. I sure won't.